We are the Wild Rainbows. We are a group of Gig Buddies who identify as either Lesbian, Gay, Bisexual, Transgender, Queer, Questioning or other. 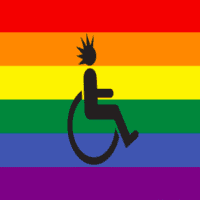 Our founding member was in the Storm and Thunder team and raised the point that sometimes the issues that LGBTQ+ adults with learning disabilities face can be different to those who aren’t LGBTQ+. This makes it really important to have a group where people can come together, safe in the knowledge that there won’t be any judgement as a result of their gender or sexuality. We meet up every couple of months as a group and are similar to The Storm and Thunder team in the fact that we also advice, guide and inform Stay Up Late and the Gig Buddies project. We like to hang out as a group and socialise. We have been to drag shows, The Lady Boys of Bangkok, LGBT history month events and lots more! If you would like to join the group then you can, confidentially, get in contact with Harri or Kate on 01273 600438.